If you have read more than one of my posts, by now you know that I love to read, explore, and learn on my own from others–those who came before me and those living, who I may or may not personally know. Over the past several months especially, I have been following those people/blogs who I think have interests in common with me. Listverse.com is one of those blogs. It is a place for “explorers who seek out the most fascinating and rare gems of human knowledge” and in the process, have fun learning. Jamie Frater is Founder and Chief Editor of ListVerse. He started his professional life as a software developer until he abandoned it to do postgraduate studies in opera at the Royal College of Music in London. Due to an insatiable desire to share fascinating, obscure, and bizarre facts, he created Listverse and left the singing for the shower. He currently divides his time between managing and Editing for Listverse, learning about all things obscure, and trying to find time for a social life. Many people are put off by the obscure symbols and strict rules of math, giving up on a problem as soon as they see both numbers and letters involved. But while math may be dense and difficult at times, the results it can prove are sometimes beautiful, mind-boggling, or just plain unexpected. The 4-Color Theorem was first discovered in 1852 by a man named Francis Guthrie, who at the time was trying to color in a map of all the counties of England. He discovered something interesting—he only needed a maximum of four colors to ensure that no counties that shared a border were colored the same. Guthrie wondered whether or not this was true of any map, and the question became a mathematical curiosity that went unsolved for years. In 1976 (over a century later), this problem was finally solved by Kenneth Appel and Wolfgang Haken. 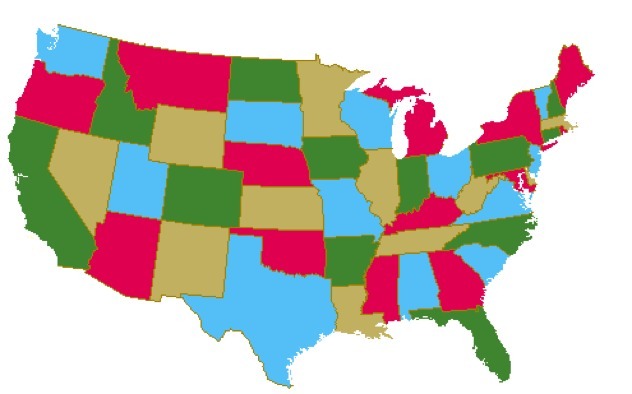 The proof they found was quite complex and relied in part on a computer, but it states that in any political map (say of the States) only four colors are needed to color each individual State so that no States of the same color are ever in contact.